Outdoor wood furniture has long been used for decorative and practical purposes on porches, decks, and patios for many years. Exterior wood furniture is very durable and can last a lifetime if it is well taken care of. Exterior wood surfaces like outdoor furniture are subjected to weathering. Water damage, sun fading, mildew, and graying are common of unprotected wood furniture. Every couple of years or as needed, wood furniture should be cleaned and protected with a wood stain. This will prevent weather damage and prolong the life of the wood furniture. Place the wood furniture in an area outdoors that is out of the way and safe for cleaning. Cover any plants, grass, windows, or other non-targeted surfaces. Remove any of the exterior wood furniture accessories like cushions, pillows, straps, etc. to expose all the wood. Liberally apply a quality wood cleaner preferable consisting of sodium percarbonate. These oxygenated cleaners are excellent for cleaning wood. Use a pump sprayer or brush the cleaner on in a uniform manner. After allowing the cleaner to remain wet on the wood furniture for 10-15 minutes begin washing the wood with a pressure washer. Use around 1000psi and do not get close to the wood to prevent damage. Washing in the direction of the wood grain is desirable. Remove all the unwanted soils and graying. If a pressure washer is not available, use a stiff scrub brush and garden hose. The second crucial step is to apply a wood brightener to the furniture. This reverses the darkening effect the cleaner has on the wood and opens the pores allowing for optimal stain penetration. After letting the furniture dry out for a day or two, apply a wood stain or sealer using a brush, roller, stain pad, or garden sprayer. Again protect the non-targeted surrounding areas with plastic. Apply only as much wood furniture stain as the wood can absorb. Wipe or back brush any excess drips or runs to prevent over applying. 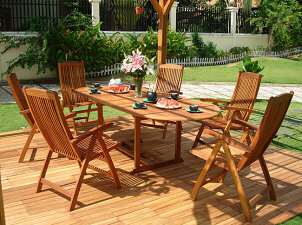 Before use, let the exterior wood furniture stain dry completely according to the manufacturer's recommendations. Reattach any cushions or accessories that you removed prior to staining. Learning to stain exterior wood furniture is not hard for any do-it-yourselfer as long as you follow some simple guidelines. It is a good weekend project that will add value and years of life to your outdoor wood furniture. Just a light water wash to remove the sand dust should be good enough for the beams. I am sanding my glu- lam beams and columns to remove old stain and I plan to go back with TWP 100 series. Do I still need to treat with RAD cleaner and brightener or can I apply the stain right after sanding. I'm using 60-80 grit. Thank you! Joanne, you do not need to stain the bottoms. Should the bottoms of the legs on outdoor wood furniture be stained? Or does it depend on what they will be sitting on? Thank you!